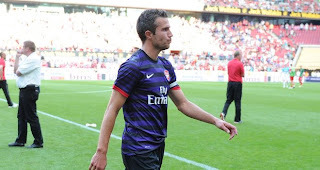 Akhil From Hounslow: Robin Van Persie - Sell or keep? Well, after heads cooled, we can talk about it without emotions. I am not one of those "sell him he is injury prone" as I also think he is "goal prone" and he can score 20 per season. There are always chances he got injured, but there are also chances he score 20-25.So Denying his move to Manure, we are denying them 20-25 goals next season (or seasons). So if he stays fit, and there are big chances he will, keeping him, not just we he added goals to our account, than also denied same number to Manure or Citeh (same crap just different color). So it is let me say 40 goals difference, and it is worth eventually losing 20 millions for his sale this summer. And if he got injured... so what, for fare more money Torres, Berbatov, Carol sit (sited) on the bench. Don't worry about RvP potential bad influence in dressing room. He is not that kind of guy. Seams to me he is only loyal to football as game, and he enjoy it, where ever he is, and I am quite sure (if he stays) he ll be same passionate about club and game as he was just 3 months ago. Quite opposite, not selling him will be huge moral bust in dressing room. As players and supporters will get proof Arsene wont let anyone play games with him.